I am trying to collect a list of interesting media that is raising these years, and it is very different from the last generation. It is typically created by an experienced media industry person, but jumped out of the old framework. Here is the starting and I will keep updating the list. @Wang Jian Shuo: Seeing the development of the situation today, felt the pain. We crossed the line, seriously crossed the line, and started a bad beginning, not as restrained as Xiamen. If you use violence to get what you want, you will get addicted to violence. Other party’s wrong deed is not the reason of your own wrong deed. Right goal always cannot prove the rightness of process. If we continue to follow the current thinking too far, China may enter into the next terrible violence-ruled circle. This was my brief comment about what I saw in Qidong (I may talk about it when I get more confirmed details. To be short, it is a large scale protest against city government’s decision to introduce pollution to the city. There are some violence happened during the protest, like throwing over police cars). There are 3400 retweet, and 1400 forward so far. Among them, many of them hurled abuse, which I am not unfamiliar with, but I was very impressed that more than half were actually supporting what I said. I didn’t expect that. Thanks. I do mean thanks to people who are supporting the rationality of our actions. When I open newspaper, especially on Weibo, bad news are coming one after another. There are a large wave of factory bankrupt and shutdown starting from this year. The wave spread out from Pearl Delta, to Yangtze Delta, and quickly spread out to the whole China. Most of the news attributed the bankrupt to a lot of factors, including the decline of export orders, and increase of material cost. But seldom can they ignore the fact that the labor cost has increased like crazy. A report mentioned a typical first line worker’s salary was about 1000 RMB/month in 2006, and that number has raised to 5000-8000. Other industry shows the same trends with 3x increase in the last three years. The percentage of labor cost increased from 10% to about 40% for many factories. Along with the sharp increase of salary was the worker shortage. Many factories have orders, and machines, but not enough workers. The worker shortage started to be a hot topic. Meanwhile, it is harder for the workers to find a job. The problem? Pretty simple, the salary issue. There is no such a thing called worker shortage. If the factory wants to increase the salary by 10x, many developers and office workers will join the factories, but the salary was constrained by the revenue. The actual problem is, the labor cost of yesterday does not attract workers of today, and the labor cost of today is not supported by the orders from overseas. In this case, there seems only one way – lay off all the workers and shutdown the factories. Thus the problem of worker shortage becomes more troublesome when there is less demand. Why when the demand goes down, the worker salary still stay up? Because the worker salary is not just determined by demand, there is a hard support – the living cost. With CPI increasing 10% every year, the workers can no longer justify leaving their own hometown (where they don’t need to pay housing, and little on food), and move to big cities, where factories are. I wrote an article about a factories in Zhejiang that was just shutdown. The writer said they had the opportunity to buy automatic assembly line to replace the manually work in 2006, but they missed the opportunity, because the labor cost is so low that to spend money on automatic assembly line does not make sense. Then 2012 came. When they cannot afford to hire workers, they are also lack of money to buy the automatic assembly line. So they went out of business. That is the point I am going to talk about in this article. Why? Think of the Zhejiang factory story I just mentioned. 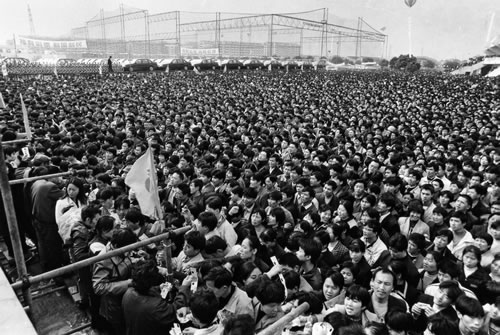 In a society automatic assembly is not justified because of cheap labor, why people worry about technical innovation? Why use machines to increase the efficiency? Why doing scientific research? Why….? In the current world, with the biggest challenge to China raises the biggest hope: Technical Innovation! When hiring people are no longer the by default choice, people have to spend time to automatic stuff and increase efficiency. Having millions of people working in shoe factories does not make sense in the global landscape. It does not justify itself in USA, and now does not justify itself in China. I would envision a China with a lot of technical innovation. The cost of building machines, and automatic systems are not lowered, but the alternative is much more expensive, just like eco-energy is more useful when oil price keep going up. I would see innovative technical companies emerging in China. People complain about lack of innovation from China for years. Now, we have a much stronger driver and reason to do so, besides weak criticism on newspapers. I do see the hope out of the disaster. Today, when I had dinner with Bruce, he asked the question about credit card. I had been following credit card usage in Shanghai for many years, and witnessed the transition from very hard to use to very popular today. However, I just realized that maybe Chinese will directly bypass credit card stage. Something we may ignore is, credit card system was invented well before Internet, or even computer was invented. Since there is no way to trace usage of money in real time, people at that time either use “check”, or credit card – one for debit, and one for credit. In China, people tend to use debit card protected with password, over credit card. They are essentially the same user experience in China. The computer system connects with the mainstream machine back in bank, and authorize in real time. When that system is in place, why bother using credit card. PayPal type of services, or mobile payment will continue to evolve and provide better solution than credit card. Then why bother? That also answered the question why Chinese people don’t use check. I never have a check book, and I believe no one in my close circle in China ever wrote a check. – Fixed line phones (in some rural areas). See? Technical trends always get dragged back by social trends. Recently, more and more articles appear in party magazines about the topic of “Draw a clear line between Socialism vs Western Democracy” (source). That brought me to some interesting similar cases. My friend told me when China first started to import movies from abroad, every movie needs a very long time to get approved. She asked why it takes so long. The person in charge said: It is very hard work to draw a clear line between socialism kiss, and capitalism kiss. If a kiss scene is socialism, it can be approved; otherwise, the scene needs to be cut or the movie rejected. What a joke! 30 years ago, the same question was asked again: drawing a clear line between socialism vs capitalism economy. It turned out that Deng Xiaoping’s “black cat, white cat” statement solved the puzzle, and pull people from meaningless discussion to do some real stuff. I didn’t make a mistake here. 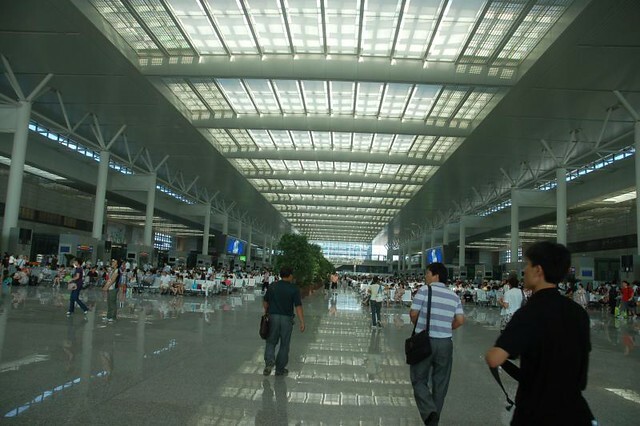 It is NOT Hong Qiao Airport, it is the Hong Qiao Railway Station. 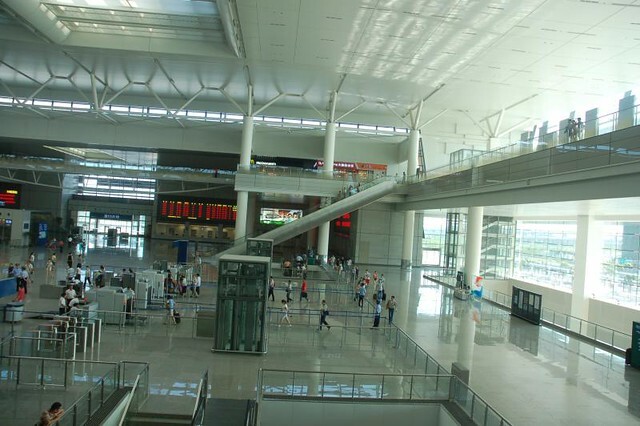 Before many people know it, the Hong Qiao Railway Station at the new Hong Qiao Airport Terminal 2 has operated for quite some time. 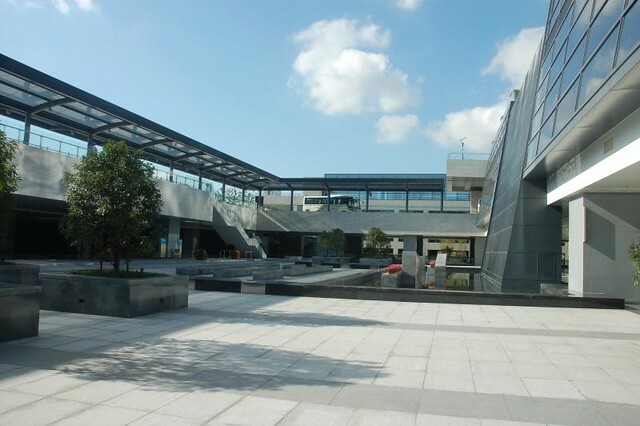 It is the new station serving the highspeed trains from Shanghai to Nanjing, Hangzhou, Beijing and future destinations. 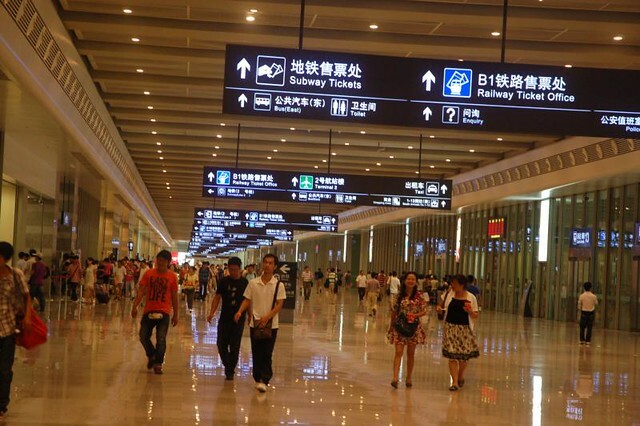 How many Train Stations in Shanghai? There are many, but only three of them really matters. The Shanghai Railway Station, which serves most of trains from the north and west for Shanghai; the Shanghai South Railway Station, which serves most trains from the south, and the Hong Qiao Railway Station, which is built just for the high-speed trains. They are not strictly divided by destination. So do check your ticket before get onboard a taxi or metro train. This train station is, again, as most Chinese buildings, the newest, biggest, and nicer train station, even better than the recently build modern Shanghai South Railway Station. Below is the B1 level of the station, where all passengers arrive. Unlike all the design of train station I saw in China, this tunnel is not just a tunnel. It is a shopping center by itself. On the right hand, you can see a row of glass doors. That are the exit from each platform, and on the left, are the food court, and shops. The departure area of the station is at level 2. It is a big area of seats, with check-in gates arranged on the both side. Thanks to the transparent high ceiling, it is pretty pleasant to wait there for a train trip. From the top, where they have a McDonald’s floating somewhere near the ceiling, you can see the seats better. This is the McDonald’s I was talking about – hard to recognize – somewhere near the ceiling. From the middle of the runway on the top, it is a symmetric view. 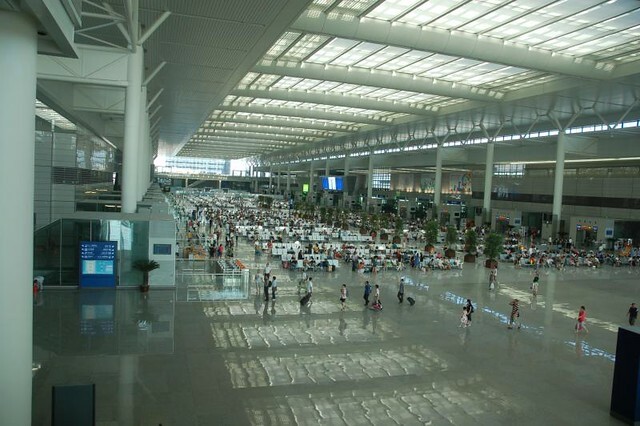 Besides the Hongqiao Airport, Maglev Station, Metro Station, and Railway Station, it is also a big Long Distance Bus Station. Here is the roof of the station, which is on the west side of Railway Station. 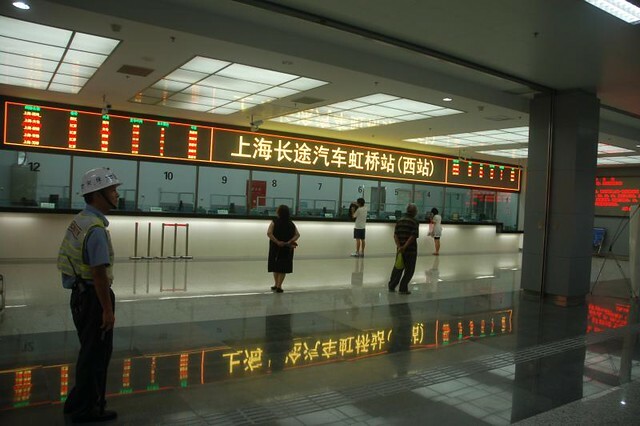 The ticketing office is at the B1 of the station – passengers can directly get here after getting off train. Education. Although questioning authority is a virtue, it is so hard to do so in the current exam driven tests. There are fences everywhere to prevent students to think about. If a student really pursues the truth, and asks questions related to the culture revolution, China’s involvement in Korean war, he will be in big trouble, so is his/her teacher. The reason is political reason. GN left an interesting comment about the question “What he did 20 years ago”. If his provide the real answer, he will be in jail. Today, everyday there are fake news in the media. Comments related to the truth are always deleted. For me, when I write blog, to keep honest to my heart, I have to avoid the most sensitive topics. I know there is a big area of topics I cannot touch. As foreign media reported, I tend to “shy away” from them. To tell the truth is easy, but to bear the tremendous cost (including safety of life, or future of yourself, or family) is hard. Ridiculous rules are not changeable, then cheating can be the only choice. It is just the ridiculous situation when you see always-red traffic lights on all directions, or the speed limitation on an expressway is set to 5 km/hour. If there is nothing you can do, you break the law. If you are asked what you did, and tell you you will lose everything, and you are supposed to tell a lie as everyone else, you face a hard choice. Human nature is the same. I received enough negative comments under the blog How I drive in Shanghai. Don’t be too quick to justify others behavior without being there yourself. When we look at the biggest tragedy like what Nazi did in WWII, we know it is the system that went wrong, not just the people involved. We are in the tough times in the Chinese history to face these systematic problems. Having said that, as always, I am optimistic about the future of China. The dishonest behavior will be less when people can remove the fear they have in the bottom of their heart and build a system for the “good people”, and start to allow the universal principle to survive on this land. – French proverb and quoted in and inspired the title of the Chinese novel, Fortress Besieged. After being passionate about bigness, and the magnificent, the splendid, and the modern, I started to learn to appreciate the beauty of smallness. Grew up in a mid-sized city, Luoyang, in the middle part of China (with 6 million population), most of the things around me are small. The biggest building in the area of my school is a theater. In the current world-class standard, that theater is just a mini model of the real theater at 3:1 scale. The tallest building in the area is 6 stories high. In the current Shanghai standard, the lowest residential building that is not classified as a villa. The road is narrow – just one wide lane in each direction, making it difficult to pass. That was the memory in the early of 1990s. My first visit to Beijing in 1993 shocked me a lot. I loved the high-raised residential buildings that stands 18 floors high from where I stand. The contrast made me, and I believe many Chinese people, to admire the height of the buildings, and the width of the road. Later, after I am transplanted to Shanghai, the high buildings, and complicated road system, including the traffic jam, are mixed together to form a scene of the modern, and the future. “How I hope one day, Luoyang can be as big as Shanghai!” I dreamed when the tallest building of 14 floors in height was just under discussion. After 15 years in Shanghai, and travel to many places in this world, I started to really understand the beauty of smallness. I started to enjoy travel to the old Hongqiao Airport T1 instead of much more modern, and big Pudong Airport, because the small airport provide easy access to the city, and don’t require me to walk too long. Just few years ago, the bad news of losing the chance to fly to/from PVG would ruin my entire day. The airport I like most started to be the Nanyang Airport, and Aspen airport, where you pick up your luggage at the side of the aircraft, and everyone walk from the plane through the small room (they call it terminal), feeling as the VIP of VIPs. I started to love small town like Aspen, CO, or small city in Hainan. If I have a choice, I live in places like Aspen where there is just 5000 residents. Los Angeles? Oh. No. Thanks. New York? Oh. No. Thanks! Smallness is the outside of my besieged fortress. I uploaded a photo of an advertisement of a Sichuan restaurant onto Facebook (/jianshuo). They were advertising for cash deposit card. If you deposit money (pre-pay) into their card, they give you discount. There is nothing new about it. However, the tricky part is the amount. If you deposit 100,000 RMB, you can get 120,000 RMB worth of credit to buy dinner in that restaurant. I didn’t make the mistake. That is 100,000 RMB, or roughly 15K USD, for dining card. This is obviously not the highest amount. There are many other places offering card level higher than that. Because of the popularity of these card, I am convinced that many people buy it. What that means? The first question to ask is, who buy it? The second question, what for? Is it just for the discount? Not likely. People have all type of creative way to use that card. People may send it as gift (bribe or not), or people can expensive it at somebody else’s cost, or simply a business owner who need to frequently buy dinner for their client that uses up 100K RMB quickly just for meal. Wendy and I drove to Jiaxing via the formal A8 Shanghai-Hangzhou Expressway, and found out that the signs of the expressway have changed to its new name: G60 – Shanghai-Kunming National Expressway (or Hukun Expressway 沪昆高速). Let me tell you more about this national highway. Although there are many criticism about the high cost and convention change of the new National Expressway system, I feel excited about the change (if we put aside the cost). The name gives people better sense of direction. A8 is Shanghai – Hangzhou Expressway (named under the Shanghai local naming convention) tells you that beyond the horizon of the road before you is Hangzhou – 151 km away. You don’t know where the road leads to beyond Hangzhou. G60 is the new name of the same road. It indicates the road start from Shanghai and ends at Kunming, Yunnan Province, a city that is 2730 km away, southwest of Shanghai (near the boarder of Burma. That inspires me of the bigger picture of the whole China. I wish to be able to drive along the G60 to see other parts of China better. But before I start planning for it, let me just do some research on paper. Below is the photo of G60 near the intersection with G15. 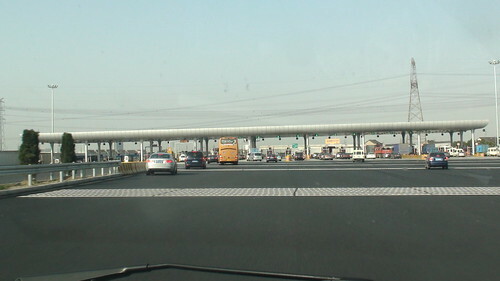 Toll gate near Xinzhuang in Shanghai. The G60 connects the following cities. I use the city of Baixing.com as the link, to give myself a chance to virtually visit every single one of them. In total, there are 17 cities along this G60. Below are the detailed explanation about the road. The G60 is exactly the formal A8 in Shanghai. It started from Xinzhuang Interchange (the largest interchange in Asia). The interchange connect A20 (now S20), S4 (formally A4), G60, and Humin Elevated Highway and many local roads with each other. The G60 is exactly the Shanghai – Hangzhou Expressway before it hits the Hangzhou Ring Expressway. My GUESS is, it turns southwards at the Ring Expressway, and use the current Hangzhou – Jinhua – Quzhou Expressway (Hangjinqu Expressway 杭金衢高速公路). The Hangjinqiu Expressway ends at the border of Zhejiang and Jiangxi – a small town called Liyuan. From Google earth, we can clearly see the big toll gate. A side note: the toll fee of expressways are collected by each province separately. In Jiangxi, the first part of G60 is the formal Liwen Expressway (Liyuan – Wenjiazhen Expressway 梨温高速). The passes Shangrao and Yingtan before it arrives at the Jiangxi capital Nanchang 南昌. After Nanchang, it is named Changfu – Jinyu Expressway (Changjin Expressway). It ends at the Jiangxi and Hunan border – Jinyushi 金鱼石. 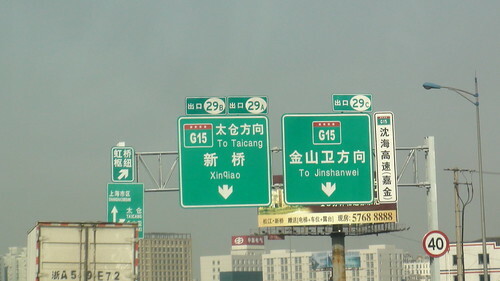 Unlike other province, Jiangxi named the expressway using names of very small towns, like Jinyushi – the exact town where the road ends in its border. Other places like Zhejiang used bigger city names, like Hangzhou – Jinhua – Quzhou Expressway. Personally, I feel the Jiangxi’s naming convention is more interesting since it created something so unique that people cannot obviously see the reason of the name, thus make it more unique, but it is not as clear as the bigger city naming convention. As in other provinces, the G60 in Hunan consists of 4 sections. Two of them on the east was already built before 2007, and the two on the west was just completed three years ago. The four sections have their own names. When I came to this point, I already started to understand why it is necessary to use a unified name G60 to refer to all these sections of the local highways. Even getting the names right in this article is hard work for me and it already cost about one hour, not to mention figuring it out on the road: The drivers need to be extremely good at geography to navigate in the old road system. Will work on this section later when it is finished soon. The last section from Baoshan 保山 to Ruili 瑞丽 (at the border between China and Burma) is under construction. I wonder when it will start to connect with the highway in Burma. My passion and optimist for the second tier cities is real. The recent Hainan trip, and Wendy’s recent trip back to Henan all sent a clear message to me: the second tier cities are where the opportunity lies. Shanghai has became less and less competitive because of the expensive living cost, making it less attractive to talents. When I met Yang Meng who just got back from his home town in Changsha in Palo Alto, he shared exactly the same thing with me. His high-school friends all went back to Changsha from big cities, to start their business there. He wrote a great blog about it: Golden Decade for Second Tier Cities (In Chinese). Wendy and I went back to Nanyang years ago, and found out the highway with road plate G40 and G45 – one connect the city to Shanghai and Xi’an, and another connecting it to Guangzhou, and north China. All these roads were newly built. Wendy drove along the highway in the more recent trip, and reported back – there are no cars on it yet. When third cities like Nanyang gets connected to second tier cities, it makes the second tier cities more competitive with the vast supply of labor, resources, and market. The first few days of 2010 does not show good sign for a new year. In personal life, Wendy and Yifan got cold, and many people in the company got cold. I just spent the full day at hospital – people mountain and people sea there, and waited for few hours for injection for Yifan (Hospital is Badly Needed). Meanwhile, although it is not the coldest winter, I felt the freezing cold. I am very sure that the starting of 2010 is making history. People are not aware of the meaning of historical events when it is happening. The significance reveals only afterward. BossTown has been so kind to invite me to join their program to talk about Ten years of Internet in China, and let me predict what the Chinese Internet space will look like in 2019. I expressed a polite refusal to attend the program, since today, I am not in the mood to forecast the future of Internet in China, if there is one. What did it tell us? There are more male born every year, and there is a strong imbalance. 1986-1990 is a peak of birth, and in 2000, only half of those born in 1990. Shall I worry when Yifan grows up, can he easily find a wife? Does Policital System in Taiwan Work? Be very careful of what you wish for. I don’t want to go into details but in Taiwan, politics has degenerated into a bad soap opera. While it is true there is democracy, the system has open it’s doors to many fools and crooks. The voters have no idea who to trust. And the media is forever ready to pounce on gossip leaving the leaders no time to do what they were supposed to do. I don’t know what kind of “great hope” you saw in Taiwan’s “experiment”. Was it the wrestling kung fu brawl in their parliament ? There is no such thing as being “ahead” or “behind” in political processes. The only thing that matters is weather it works or not. Yes, while you rejoice in knowing that the crook president is behind bars, what about the 8 wasted years of screwing up the country ? Politics is not entertainment. If we wait for the system to mature, the people would have starved to death. Singapore has a one party show, Japan had a one party show for 54 years. As for the often repeated “one man” of Singapore, do note that the prime minister had changed twice. It just happened that the son happened to be in charge today. Please do not equate this situation with your North Korean neighbours. George Bush Sr and Jr. were seperated by Clinton, and nobody made a stink. The independant history of Singapore is only 44 years. While it is true that it should not, and cannot be compared with China, What the “infamous” man and party acheived is truely impressive and astounding. When you have the lives of one billion people at stake, the last thing you want to do is “experiment”. Here was my reply, and I would like to involve more people to discuss on the political system in Taiwan. Regarding Taiwan, as my disclaimer goes, I don’t know too much details, but I want to share my thoughts based on the limited information I got from news (NOT CCTV news). Re: fight in parliament. Fight is not a problem. If people don’t fight in parliament, they either fight on the street (violence!) or the rights of certain people are suppressed. I don’t believe it will be physical fighting for too long – it is just starting point. Re: selection of CHEN Shui-Bian as president. The fake bulletin worked, and many fake promise worked to get him the way to power, but can we have a better way to educate the mass people about how vote works? People need education to excise the power in their hands. The education is not a easy to do – it takes centuries, and many generations. When history story like “President Chen” appear in the text book, people will learn how to vote. I don’t believe that people including myself will know how to do it without excises it many times, and make some mistakes. Re: sentence of CHEN. The court only proved guilty for one former president, and people point fingers to them (especially CCTV and all media agencies in China by the order of central propaganda department): Hey! 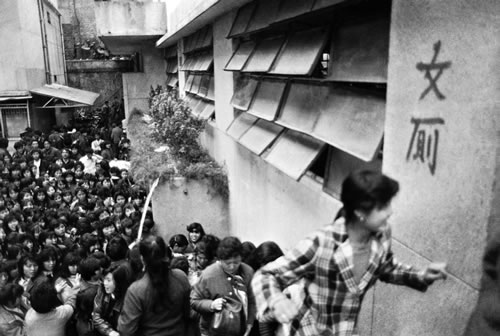 Look at what type of president democracy brought to Taiwan. The recent MA got very embarrassed because of the late response to earth quake. Shall we complain that Taiwan don’t have a “God” like Chairman Mao, or Chiang Kai-shek or Chiang Ching-kuo. Well. That is because they have put everyone who think they are bad into jail, and then they naturally became God. To have a graceful president means the president is above the Republic, and to have an embarrassed president like CHEN and MA, or Nixon, Clinton in US is no embarrassing, it is the hard fact that the Republic is above the individual, which is the goal of the founding fathers of the Republic of China. Re: politics has degenerated into a bad soap opera, yes. It appears so in the last 8 years. But it is just like seeing a new born baby – you see it is on the track to be better – I am sure a second guy shoot is counter-productive for the next president candidate. There will always be new ways to fool the public beside what CHEN did, but people will be educated. I cannot imagine a way for people to progress without real practices like this. Between a dead-end road system that appears to be strong, and a promising system just like a new-born baby, I would like to generally classified Taiwan to the later. Did I see progress from LI, to CHEN, to MA? I think so. Re: When you have the lives of one billion people at stake, the last thing you want to do is “experiment”. Yes and No. The hope of China lies in many people at least think about it and understand what the arrow of history is pointing to. Unfortunately, no one can possibly know the result of any change (or as you call it, experiment), including His Majority Chairman MAO, but I believe in natural evolve of human society. A little bit long, but I’d be happy if someone educate me about a real Taiwan if what I am having is just an illusion. I never been to Taiwan or lived there, anyway. I am in Tongchuan – I am flying back tomorrow morning. Tongchuan is a typical city in west China: it is not a capital, and it is not very small – the second (at least from the order of vihecle code – Shaan B) largest city in Shaanxi – just like Luoyang in Henan. It has too major issues. Tongchuan developed several decade ago because of the coal storage. The coal fields are the major economic source of the city. 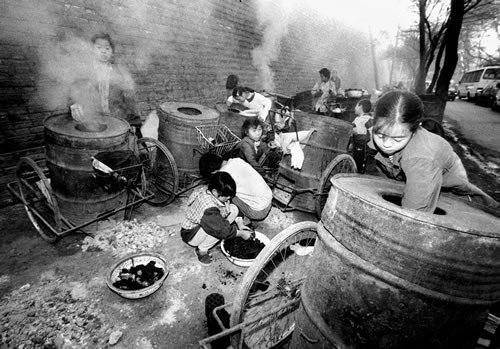 A large portion of the city population still speaks Henan accent, because the huge labor needs from the miner factories. Now, as quick as the raise of the city, the mine of the city is used up. Can you imagine what it means to this city? New coal storage was discovered in north Shaanxi – in Yanan, and Yulin area, and wealth quickly moved northwards, living Tongchuan on its dying-bed. Tongchuan, as the character Chuan suggested, is the only valley to the north of the Shaanxi province. There are mountains after mountains everywhere, but Tongchuan provides a road to access north area. Everyday, hundreds of thousands of cars and bus, and trucks go through the city of Tongchuan, making it the busiest town along the road G210. When I returned to Tongchuan in 1990 for summer, I counted the number of cars on the road before where I lived: it is as busy as the rush hours of Nanpu bridge in Shanghai. The difference is, the road is busy 24 hours a day. Today, the new expressway were completed, and the road runs on the top of the hills, not the valley. It is exactly the story of Cars. Just like the detour of route-66 made the small town abandoned, the city of Tongchuan faces the same fate. Yes. No one still needs to visit Tongchuan. People in Yan’an can drive 2-3 hours on the expressway to get to Xi’an, without being aware that they have passed Tongchuan. With the raise of many cities, like Shanghai or Yan’an in Shaanxi, or Shangqiu in Henan, many Chinese cities like Tongchuan and Luoyang lost their position. I have unique feeling to these two cities, and feel it is a pity that they have to go to the direction they are heading today. This article actually echos to what I wrote more than one year ago on my Chinese blog The Tragedy of Humanity, and Love for the Guilty. If you can read Chinese, I’d suggest you to read it. My thought about the guilty and humanity never changed since then, and I don’t know how to translate many of the words in that article. Here are some additional thoughts about it. When someone was got by flu, and he/she infects others, we know that we need to cure the person instead of kill him/her, even though the disease spread out from this person to others. Why we know it is the disease that we need to fight against, not the person himself? Because we know we are human, and all human are vulnerable to diseases. Besides curing the patient, we need to go further to build the facility to reduce spread of diseases in public places, and educate people to wash hands often, and stay at home when infected. However, when it comes to crime, and the guilty, we tend to believe it is the PERSON who conducted the bad deed that we need to get rid of. We hate people who kill others, or who cheat, and who started a war. But the most dangerous conclusion I heard of is, they are different from us. They are bad guy, and we are the good guy. After killing them or putting them into jail for their entire lives, we solved the problem. No. They are not different from us at all, since we share the same thing: humanity. Besides love, there are negative, dangerous, and disastrous factors in the humanity, such as fear, greed, and hate. Everyone has that inside ourselves, but most of us are so lucky that the fate hasn’t played a trick with us and put it into a situation that triggered this bad nature of humanity. However, many people are not that lucky. Hate, for example, is very infectious. When Tim beats Jack on the shoulder, hate rises in the heart of Jack – exactly as the virus spread out from Tim to Jack. Jack will naturally go mad, and fight back and hit Tim on the face. A higher degree of hate infects Tim. If Tim or Jack cannot find justice from the society (a court, or police), they tend to rise the level of the conflict, and eventually, if someone is really driven mad, he will kill the other person. That is the typical tragedy in this world. In real situation, things are much more complicated than this. I hate thieves. I obviously support to punish the thieves according to law, but we need to go further to understand why it happens. How the thought of the thieves were infected by greediness (“I am convinced that stealing is the quickest, and easiest way to be rich), or fear (“I will starve if I don’t steal. No one in this world really care about me.”)? They are the patient. To put them into jail is just like to put a patient into hospital. They need to be cured, in a hard way. This is the continued discussion of my last article: I am a Rich Person?. I hate all kinds of bad behavior: the mason who laughed at me and blackmail me to give him more money (just 50RMB) by being bad to me, or the security guard who never thought about what service means, and who is the owner of the property, and I hate the movers who cheat, increase price 5 times during the move, and scratch my table without a sorry. I hate those behaviors, but I also need to understand that they were infected by diseases, just as I was often infected by mental diseases like thinking I am the center of the universe. We need to fight against the spread of the disease, not the patients where are infected. The guilty and ourselves are the same – with the same humanity. We are programmed inside that we may lose temper. That is the nature of the human kind. The tragedy drama kindly remind us that we can very easily be the bad guy in real life. Never think that we will not conduct crime some day in this life. We don’t not because we are different from people who conduct the crime. It is just because we are lucky enough that we were not infected by extreme hate. If you ask any of the people who killed someone, do they believe they will do it before they were triggered by something? They do it because they feel hopeless, they feel so angry, and they don’t believe there is any other solution to solve the problem. We are very likely to behave the same way – it is just the nature of humanity. That is the reason we need to work hard to prevent people getting into that terrible situation, and to offer help when they need it. That is to help ourselves. I am a Rich Person? It is a very tough topic, and it is surely controversial. But it puzzled me a lot and I take the courage to share it. In the last few years, I wrote an article The World of Different Rules talking about my conflict with a mason, and another article talking about my conflict with security guards. The root cause for the conflict is, I think, my hope of a better country – a country with more respects, and with more rules – A country that people respect private property, and a country where people are eventually equal – not because being rich or poor, or the positions they hold. Everyone should follow the rules, and be equal. I saw so many injustices the rich people did for the poor people. However, recently, I bitterly reflect what I am doing, and I started to ask the question: Am I seen as a rich people from the poorer people? Obviously I won’t be naive enough to say I am still the poor. Rich is a relative term. My Ayi in Shanghai earns more than a middle school teacher in Luoyang, and an intern in my company earns more than most people I know in Luoyang, not to mention the rural areas. The gap between Shanghai and other part of the country is as obvious as developed country and developing country. Should I feel evil about it? In Shanghai, after working for 10 years with pretty nice track record, I am relatively richer than people who just graduated, or people who are not fortunate enough to receive university education and are still doing labor intensive work in this city. Should I feel guilty about it? When I use the newly developed standard of services and the sense of “justice” to judge people I often felt angry, and there are more and more conflicts between myself and other people. I started to yell at drivers who don’t yield to people on pedestrian when they do right turn. I started to educate service people behind the window of banks to show respects to their clients. I even started to educate people in the government that they should pay respect to citizens, and should not yell to them, because they are not their slaves; I was even naive enough to mention to them that it is the tax payers money that supported their job (I was surely laughed at loudly). Anyway, there are so many situations that I feel I am right, and people are doing something wrong. It happened this way. There are three unlicensed moving workers who successfully cheated us to believe they are Qiangsheng Moving (a good moving company), and scratched the most expensive table we had in our home. Then they pour some oil onto the table trying to fix it, but only turned the surface to a complete mass. They believed as long as they didn’t do it intentionally, there is nothing wrong with what they did. I insist that they should pay for the damage. They laughed at me, and they insulted me for being stupid, and they even joked: “What a million dollar table you have! Why not tell me that the table worth 1 billion dollar!” It is the attitude they show that drove me crazy, exactly as the mason and security guard example. Obviously, they don’t buy in my ideology of a world of justice. When I insisted to fight with them, Wendy said this to me: “How can you justify your table to worth one week of their hard work! Do you really feel good when they give you the money that they earn with hard work?” Unfortunately, I felt Wendy is right. We paid the full amount of the money they blackmailed (jumped from initial 168 to 700 RMB finally) in a mixed mood. It is the environment that forced them to do bad things. They are living harder lives than we do. Wendy helped me to stay humble and grateful to this world, and don’t be the King of the Universe. I painfully realized the facts that I am stuck here. I never really thought about it, but I have to admit that I am treated as the “Rich People”, and according to what I did – so arrogant, and so self-centered, I am fully qualified to the “bad” rich people in novels I read when I was younger. I had the conversation with Robert Mao many years ago. He was shocked when he returned to his hometown. He naturally stick to the habit to say “rich people are always bad”, as the propaganda in China educated people for half centaury, but only to find out that he himself became the rich people that his villages hated. Again, unfortunately, he IS the rich guy in his village. When I think about it, I cannot justify the big gap between the rich and the poor. If you ask me, I won’t treat myself as rich people. I am just an IT professional turned entry-level entrepreneur in the last 10 years, but what I see myself does not matter. I found myself cannot justify why a cup of my favorite Starbucks worth about 3 hours of hard work of an Ayi, or several day of work for a servant in the city of Luoyang, or even worth, monthly income of people in my hometown. Again, should I feel guilty about it? The gap between the rich and the poor get bigger and bigger in China. The tension between the rich and the poor gets bigger. I feel so bad when I am classified to the rich camp. But is there anything I can argue about it when people really think so? After painful reflection, I started to adopt another philosophy. I should work harder to build a society with more justice by thinking writing, and then actions, instead of being mean to the people who provide bad service. It is their fault not to provide the service they should (according to my biased standard), but the root cause is not their fault. Why this society does not provide good education, good compensation, and good fare ware for everyone? It is not impossible. P.S. Please don’t be harsh to me when I brought to this private and sensitive topic. Let’s address the rich and poor conflicts in China, instead of discussing I am rich or poor – it is relative term. I am perfectly conscious that to be able to consume a cup of Starbucks does not qualify me to be on the cover of Fortune magazine. I am not an economy expert (or even entry level learner), and actually I don’t know too much about the discussion my reader Rimbaud initiated, with DB following the comment. But I think it worth some serious discussion. The decrease in value of US dollar and strong RMB trend IS an important issue to discuss, and so is the losing of wealth from China because of it. This is what I am going to do. Let me post Rimbaud and DB’s comments here, and then open for discussion. I think it will be an very interesting thread, and it will be very educational for me. I’m not sure how familiar you are with American slang, Jianshuowang, but in the USA, we would say that “the USA has played China for suckers”– i.e., the USA has tremendously screwed over China. Honestly, the transfer of wealth out of China now is worse than the Opium Wars, the Unequal Treaties and the Boxer Rebellion Treaty combined! The USA has essentially stolen perhaps $150 billion = 1 trillion RMB out of China, because the Chinese Central Bank has been investing the hard-won savings of Chinese people into US debt (mainly US Treasury Bills). Yet our economy is shake and on the brink of collapse– the USA (individuals and government) is deeply in debt, and we make it much worse since we still spend trillions on war weapons and the War in Iraq. In other words, the US economy is not viable over the next 20 years– we’re going to default on our debt. So you Chinese are losing over a trillion RMB on those T-bills you have bought. Look, I’m sorry but I have to be honest here– why is the Chinese Central Bank being so tremendously stupid? You are essentially giving us Americans trillions of renminbi that you Chinese have earned from hard work– just giving it to us, for free, even though we Americans spend way too much and save too little. We don’t save for ourselves– so, you Chinese (via the Chinese Central Bank) have been giving us your savings. We Americans are deeply in debt right now, our real estate sector is in collapse and we are entering a recession. Our schools are terrible, our infrastructure is crumbling and our manufacturing and knowledge sectors are in terrible shape– in other words, the United States is rapidly declining and our economy is slowly collapsing. Whereas, you Chinese work hard, have good schools, and are actually generating savings and wealth. Yet then you waste your trillion RMB of savings and wealth, which you earn from hard work, and you give it to us profligate, non-saving American borrowers. So Americans are basically taking advantage of the Chinese, I mean honestly– your Central Bank has basically been letting the US steal over $100 billion of Chinese savings away! And with recent major inflation in the United States, all those T-Bills and bonds that the Chinese Central bank has been buying, continue to fall in value. 1. DIVERSIFY YOUR FOREIGN RESERVES!!! For goodness’ sake, if the Chinese people have extra savings, don’t invest those savings in declining, worthless US Treasury Bills, not even we American investors do that! Spread out your reserves– get some Euros, yen, Korean won, rubles and ringgit. Rather than buying up worthless US Treasury paper, also use your reserves to get raw materials (copper, coal, petroleum, gold, silver and land). In other words– get things with tangible value, not US Treasury paper. You can still buy some US dollar-denominated assets to prevent the yuan from rising too quickly– you want a slow, gradual rise in the yuan, not the kind of rapid rise in the yen that ruined Japan’s economy in the 1980’s– but get things that are tangible, not just financial paper. 2. Use the dollars that the Chinese Central Bank already has, to get things in the USA specifically that have real value– again, things like ships, ports, natural resources, factories, coal, food, even research labs with lots of technological expertise. 3. Get out of dollars as soon as you can. Every time the dollar gains a bit in value, take advantage of the gain to sell your dollars and make gains. Do this gradually so that the dollar doesn’t fall too fast, and you can get yourself out of dollars. 4. Remember that a few other countries (outside the USA) also use the dollar: Ecuador, Panama, Liberia, El Salvador, US Virgin Islands, East Timor and many Pacific islands. Use this to obtain dollar-denominated REAL ASSETS from them (natural resources and even land if possible) using the dollars you’ve built up. Again– get rid of your dollars gradually, using a method like this. 5. Exchange dollars for yen and buy up goods and resources in Latin American countries that use the peso, since the Japanese yen and the peso used in many Latin American countries, have not risen much against the dollar. So, your dollars can still get many yen– with the yen an undervalued currency likely to rise soon– and can also get many peso-denominated natural resources and other goods in Latin America, since the peso is one of the few currencies that has depreciated relative to the dollar. A. German– the German-speaking Central European countries, Switzerland, Austria, Germany, E Belgium, N Italy and German-speaking regions in Eastern Europe– are now leaders in many fields of high-tech, especially in emerging Green Technologies, which will be the top technology of the 21st century. Learn German, the main language of the EU, and increase your trade and links with the Germanophone region of Europe. B. Portuguese– among growing economies, Portuguese-speaking Brazil is by far one of the most encouraging and healthy, as well as an excellent source of raw materials. Portuguese would be very useful. C. Hindi– Closer contacts with India and its own strong economy. D. Spanish– Trade with Latin America, very rich in natural resources. E. Arabic– The oil-exporting Arab nations will be among the wealthiest of the century, and obviously better business contacts can be quite useful. F. Japanese and Korean– obviously valuable for trade close to home. Again, I have to be honest here, because I feel that far too many Chinese are naive, and think that Americans are nice people who see the Chinese as “friends”: Most Americans either hate China, or fear and dislike you, and there is nothing you can do to change it. It’s not your fault– the reason for this is that the US media is full of anti-China propaganda and hatred. During the Beijing Olympics, when China was doing a magnificent job and being praised by the world, American news outlets basically spent the entire Olympics claiming that China cheated, claiming that China has a totalitarian and evil society, claiming that Chinese Olympic athletes are kidnapped from their families at age 2 and forced to train. It’s all false, but I’m telling you– this is what US media reports because they make money with it, and since most Americans get their information from the media propaganda here, they hate China. There are of course, many millions of Americans who respect China and like the Chinese people, but unfortunately the majority aren’t like this– Americans can be extremely narrow-minded, provincial, xenophobic and even racist people at times. So please, stop being so naive and be realistic, stop linking your entire economy and system to the United States so much. I like the fact that China is a humble power, hospitable, and does not interfere with other countries– that’s an excellent trait, and it will continue to serve China well. But at the same time, have some confidence, and stop pretending that the American system for education, business, technology and so forth is the best in the world. It used to be, but we aren’t the best anymore– we have some good qualities but also a broken, arrogant, small-minded system here in many ways. Just treat us like any other country– one to be respected, and treated hospitably, but just one country among many. DIVERSIFY your economy and system more and don’t depend on the USA so much, build up relations with the EU, Arab countries, Brazil, Latin America, India, Japan and other countries, and not so exclusively with the US itself. 1. Invest your savings in Chinese national infrastructure (roads, bridges, public transportations), in Chinese science and technology (and publish your scientific, technical and academic papers in Mandarin Chinese, you have to make Mandarin into an international language for publishing important ideas and findings, for Westerners to take China more seriously). 2. Also invest your savings in Chinese universities, provide seed capital to Chinese entrepreneurs to start more “Chinese silicon valleys,” invest in renewable fuel technologies and research (tidal, wind, solar, geothermal, fusion and hybrid/electric vehicles), a Chinese space program, the arts and so on. 3. In general, invest in and encourage the domestic Chinese economy instead of buying US T-bills. Honestly, the way the USA has screwed over China with the loss in the T-bills’ value– it’s just like the Opium Wars all over again, except in this case it’s the naive Chinese Central Bankers who have just given the United States the equivalent of 1 trillion RMB of silver! He talks a lot about gradually shifting out of US T-bills and into the Chinese domestic economy, not just domestic consumption but domestic infrastructure, science and research (with good intellectual property protection and contract law), as I discussed above. if you intend to open a discussion on this, you should probably start topic of its own. China’s leadership has deliberately chosen to manage its currency against the USD and has thus gained early front-loaded benefits (export growth + job creation in the export sector). Now they are incurring back-loaded costs (currency losses, pressure on the PBoC to continue incurring currency losses to keep the RMB from appreciating amid the global slowdown). It seems as it this was an unwise decision. I agree with you that the China’s leaders have made a wrong decision. The question now is, how do we solve this problem? And who needs to act first? Is it up to China now to act? Or do Chinese politicians take the position that the bad and deceitful Americans, who have taken the Chinese to the cleaners, must take action first to clean their hands and compensate China for the currency losses? In any case, this is and will remain a very exciting issue, and there are many great blogs covering the intertwinement of economies and the excessive global flow of capital at great length. I enjoy the 150 photos posted on EastSouthWestNorth. They are about real China. I don’t know whether the original source of the photos. I assume it is the web site, and credit goes to EastSouthWestNorth. I am re-posting some of the photos from the site, with my comments. I only pick those I personal feel very familiar to me, and add my observation to it. I hope the effort will help people who don’t know China to see the other side of the country, instead of just a country related to "Human Rights", "Tibet"… (I admit my own ignorance that only after I really took time to study what happened in Darfur did I understand Darfur is actually in Africa. I guess China may be the same for many people, who cannot really point out where China is on a map). These photos are quoted from the web site EastSouthWestNoth. 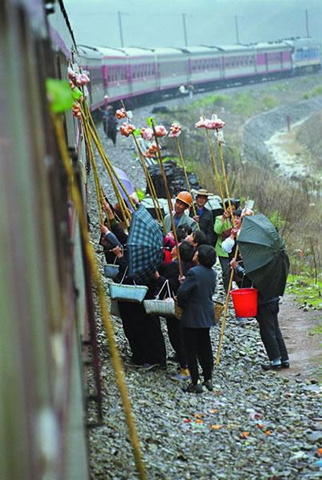 I don’t know the photographer, so I cannot gave credit, but the photos are very good and reflect real China very well. If anyone know who is the photographer, please let me know, and I do want to give big credit to him/her/them. There are many photos in the original site. Most of the scenes look very familiar to me because I saw it all the time in the last 20 years. But I will only choose those scenarios I have personally experienced. I just don’t have camera at that time, and I don’t have the skill to capture the scene, but they did exist in my memory. 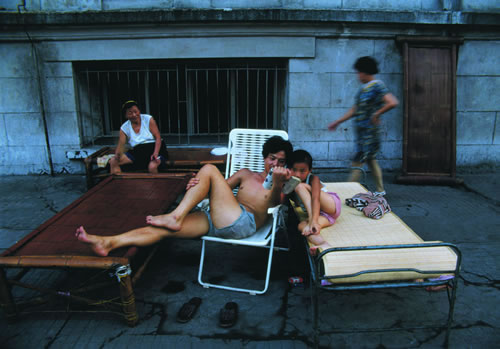 Also, most of the photos seems to be taken in 1990s in China. It is not current China. For current China, hopefully my site helps – I have many photos! Here come the Photos. Below: too many people to get on to a train. This is exactly my initial memory of a train. I also entered a train via window! My memory is even worse than this photo. My home town is Henan, the province with biggest population, and there are just very few trains at that time. It is basically a war for everyone – people inside are fighting very hard to close window, to avoid people crawling in (thus make it even more packed), and people outside are "attacking" the window. If there is one open window, it is just like a hole in a dam – many people will get in and there is no way to close the window before the train moves – after train moving, there will still be people in the middle of the window! To be short, my memory of train is even worse than this image. Look, there are still open window there at least. Imagine what it looks inside. Bathroom is full of people, and no one can manage to move. People are everywhere – on the top at the luggage rack, on the floor under each bench, sitting on top of the back of the seat, or just manage to keep balance on the table. It is not news if someone manage to take 10 hours of train ride with only one foot on the ground. This was my experience back in 1990s. If there were color on the photo, you will see the train is green. Now the trains are replaced with CRH trains (with photo), and this scene is very rare in China now (I don’t think it has completely gone away, since during Spring Festival, in some section, this scene may also on show). If you ask me, I am pretty happy with the change, and talking about human right? 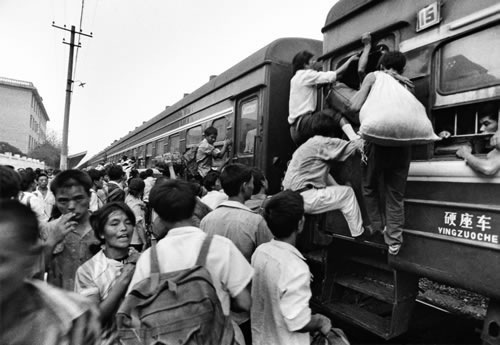 I stand firmly that we need more freedom in speech, and political rights, but the right to enter a train from door is also part of human right, and I HAVE TO give credit to people who made it happen. (Of cause, we need to reflect as a nation about who pulled the rich country in the past into the bottom of poverty and chaos). According to the original title of this photo, the train station is full of people going down south to work, so that the bathroom line is longer than 45 minutes. I don’t experience that long line myself, since the line for men’s room is always shorter than the women, but I do experience situation when there is no WC at all. In my life (in early 1990), it is not something shy to piss at the side of the road. In the village I was born (photos), water closet is just some new, and it didn’t exist when I left the village when I was 5 year old. There is a well in the village, and all water comes from the well. Restroom by definition, don’t have water in it. For my mother’s hometown, they don’t have water at all, and they have to go very long way to get very limited water. A bowl of water can be reused for many days before drop it away. This was the real situation when I was born. Until today, my mother has the habit to save every drop of water. Now they can use pure water. This is true during my trip just 4 years ago, in a tourist group to Daocheng, the Tibetan area. The first lesson the tour guide, a lady taught us was how to "sing" in the Tibet area. By "Singing", she means to go to WC. When tour bus stops, men and women get off the bus and find his/her own places. General rule is, women find further places, and men just do it near the bus. I believe it is the same today. Again, I do love more human rights in China. When I have a house, and have good job, and I want more. I want my void heard. But I am also aware that human right mean a place to piss in private with dignity. I see the change in the last 20 years as a history of improved human right record in China. This is the Instant lottery ticket purchase line some where in China. I have experienced something similar – not so many people, but pretty close. To get rich is not easy, especially in early days of China. People have enough time and ambitious enough dream to get rich. How to do it? Lottery seems the only way that everyone can participate. I was one of the person who bought lottery back in Luoyang, and dreaming to get something big. I did won a soap or two with many many tries when I was young. In Shanghai, recent years, there are still lottery like this (see the first photo, taken in 2003), but it is not the only way to get rich today. Something to note is, at that time when the photo above was taken, the job market is not open yet, and people don’t have the right to choose a job yet, and just recovered from the thinking "Money is the worst thing in the world". I have two observation. It is the crazy idea of communist to turn people into extreme poverty, and we don’t have enough reflection on it yet. However, in the economic field, China government did something right in the last 30 years. got annoyed by them. I read many foreign visitors to China wrote about the unpleasant experience to be surrounded, or traced by the local vendors, and they refused their offer pretty rudely, and even think they "don’t understand how to be polite". Well. I can be polite if I have something to eat, and have something to raise my children. It does not mean anything to be polite if I am starving. I am writing a blog about Shanghai, since I am living in this amazing city in China. However, Shanghai’s situation does not represent China at all. The image I showed is more like China. However, take into consideration that these photos are taken about 10 years ago (I don’t know when they were taken exactly though), and things changes faster than everyone’s imagination. I hope they can get a better life first – to be able to get some money to improve their lives. Democratic is important, I believe. I hope they can find a way to manage their village better, both politically, and (more importantly) economically. I saw someone criticizing that people in China take economic progress too seriously. Well. If I were the railway vendors, I do take it more serious than "environment", "human rights", "freedom" that many people care. I hope one day, they care about these human rights, but only after they have a better economic right. (Meanwhile, I believe democratic in some sense help economic growth). 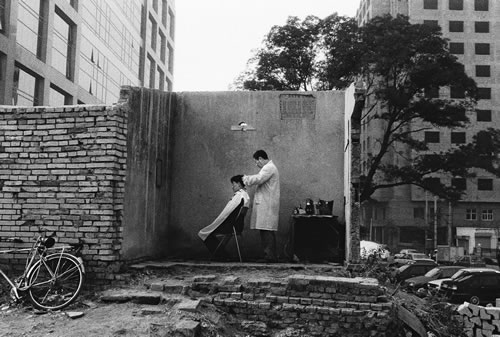 I love this photo: Street barber in a demolished room. I don’t see it in Shanghai these days (in the recent few years), but it is how people have their hair cut before. I didn’t personally experienced it, since when I was young, I went to barber shop in a room, not on the street. But I do see many older people at the same time (1990s) choose to have their haircut on the street. A room is too fancy for simple job like haircut. I am pretty familiar with this, and I was a loyal customer of these out-of-school youth selling cooked yam on the street. In my hometown, they typically sell baked potato, not yam. There are many of them. On the street, there are many shops until recently. When I came to Shanghai, I heard the news that in this city, shops offering eat on the pedestrian road is not allowed, I thought: "It is crazy! Is there any restaurant selling small things like this can afford to rent a room?" Later, I know that is the difference between a rich city like Shanghai and a poorer city like Luoyang (Luoyang is not a poor city in any way, so imagine China). I believe even people who haven’t come to China may heard of some terrible story about the hygiene status of China. Many of my foreign friends are very cautious in China regarding food – they can easily got sick after eating something we eat everyday. Well. I admit it is true. However, the point is, to have clearer food is a human right, isn’t it? Everyone wants that right, but for 1.3 billion people to have this right is not very easy. I am in Shanghai, and I don’t eat those "tasty" food any more, but I know when one day, the food get clearer in my hometown and in most other places in China, we are improving human rights in China. I hope everyone can do something positively to improve the human right record. Below: "The cadres visit the village to explain the law, and are treated to a work meal of potatoes". From the mud wall, I guess it should be somewhere in the middle of China, where my hometown is. Now to mention the farmers in villages, even people in Shanghai like myself don’t have a clear law concept. I can tell you that I have never been to the court in my life yet: never got sued, and never sued anyone. Law is something new to many people. The change from empire ruled country in Europe took many decades, and American were lucky enough that they don’t have that kind of history when the nation was formed. China is different. In previous entries, many people use the word of "brainwash" to describe the behavior of Chinese people. I agree that some of the blind-nationalism and put an equal sign between party and the country is due to propaganda and brainwash, but many other things are rooted far more than the recent 100 years. It is rooted in the long history of China. If you call it "brainwash", just call it, since in some sense, culture can be regarded as "brainwash" in long enough years, so the group of people have pretty unique way of thinking. The thinking logic is pretty common among one group of people but distinctly different from another group of people. We call it historical and cultural different, right? Below: A peasant woman and her ten children. People in China love to have more children. People in China love to have boys. Please wait to point fingers to the peasant woman on the photo and judge what she did with your value system. For a peasant family, number of children is almost equally to the production power of the family and hence the economic return of the family unite. For a highly urbanized Europe or North America, and especially after the industrial revolution, people just need a job to survive. 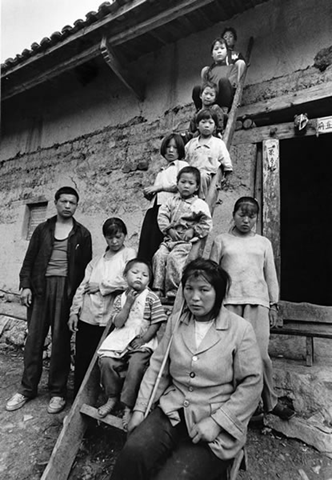 In the vast rural area of China, a family is almost can be called a company (I know it is inappropriate, but you can loosely think that way), and number of children can also be thought as number of employees. The more employees you have, the stronger the family are. (For my friends in China, I know it is not EXACTLY the real situation, but I think it is pretty easier for people interested in China to think that way. For my readers, please don’t get mislead by my comparison, if you have a chance to learn more about how rural areas in China works. The other reason is the thousands of years of family value in China. As I stated in article The Name of Chinese People, I am the 20th generation in my family tree, and my family book have detailed record of every single person in the family tree since the year of 1380 – my son Yifan, me, my father, his father, and 19 generations before him. The traditional way to record it is just to use male in the family, and female didn’t appear in the book. The family book has been past down for 500 years (in my family), and there are efforts from the family to find out the book before the year of 1380 (For your information, our family migrated from another province in that year). Many other family has more than 1000 years of record. Imagine the proud and the family value! Also imagine what if you don’t have a boy to keep the book going, and your branch in the book ends at you. This explains why people in China love boys. Recent 50 years changed it. People don’t take family book as serious as before, and I don’t know whether we should be happy or unhappy about it, whether as a nation, we are lucky to abandon it, so we don’t have the pressure to have boys, or we are unlucky to be the generation to stop the tradition that has survived in so many years. Below: The commune wash room in an apartment building. I love this picture a lot since I lived in this environment for two years since I was 4 years old, until maybe 6. If someone had a camera, they may caught me like the little child in this picture. 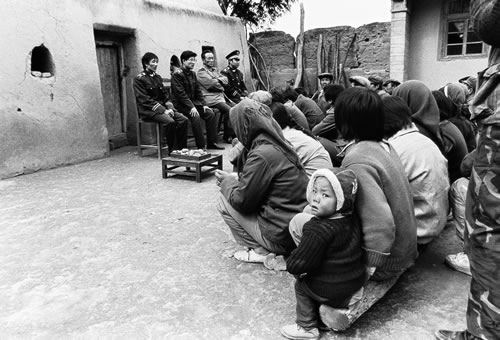 That is the living standard of many Chinese in 1980s. Relationships between people are pretty different than the current relationship in China (change in China), and also very different from the families in U.S. today. As a routine, whenever I post something related to the topic of China, I have to put a disclaimer here: Please first read a story called Blind Men and the Elephant and understand everyone is a blind man who can only possibly see part of world, and we have to accept the truth is, the same thing will definitely appear to be different to different people, and we also need to accept the really that there are many different but all correct answers to the same question. China is so big a topic, and it means the people, the government, the land, the culture, the history and many things, and it has bright side as well as dark side; it has its hope and desperation; it is mixed of the best and the worst. In any article, I can either focus on something good, or bad, but hardly can be both. Whenever I post bright side of China and express my hope to my country, there are enough comments pointing out that I ignored the bad side. What comments are exactly the truth! When I write the dark side of this country, and show my worry, there are almost the same amount of comments pointing my finger about my limited knowledge about the whole China (or the elephant in my story). These comments, again, are very correct, since no one in this world is in a position to tell people what China really is, just like the blind men in the story. This year is a unique and special year in China. I can feel it, but still cannot find a way to understand it so well. The most obvious thing is the recent completion or construction of mega-projects in China. Let me name a few in this short article, to help my friends to understand the energy and passion of life here in China. 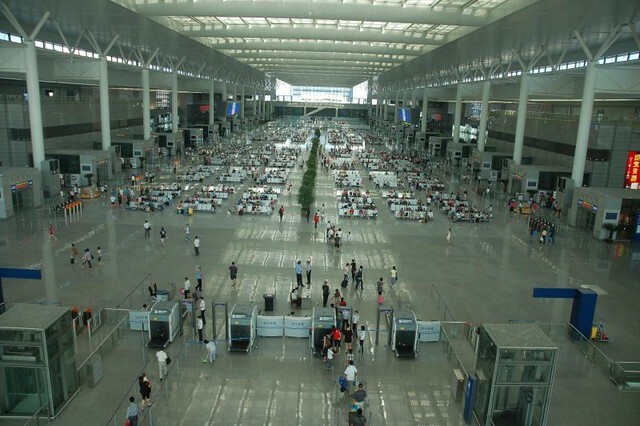 At the same time, the third runway of Pudong Airport was opened the same day. 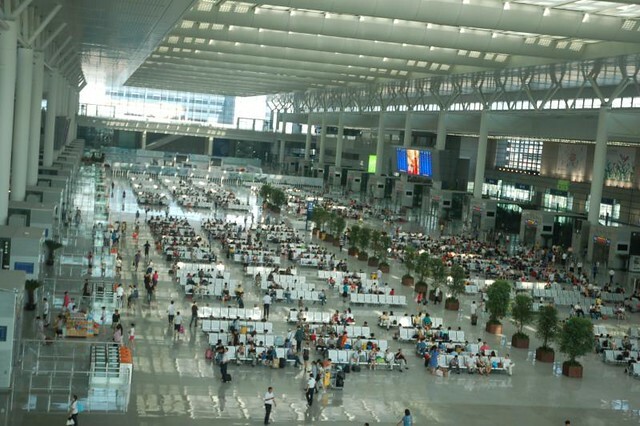 Considering both Shanghai Pudong Airport’s first terminal and the second terminal of Beijing airport were opened in 1999, you can imagine the economic boom in China in the last 9 years. Now Beijing’s third terminal is the largest terminal on this planet, bigger than Heathrow’s four added together, and also one of the largest building ever built (in term of space). 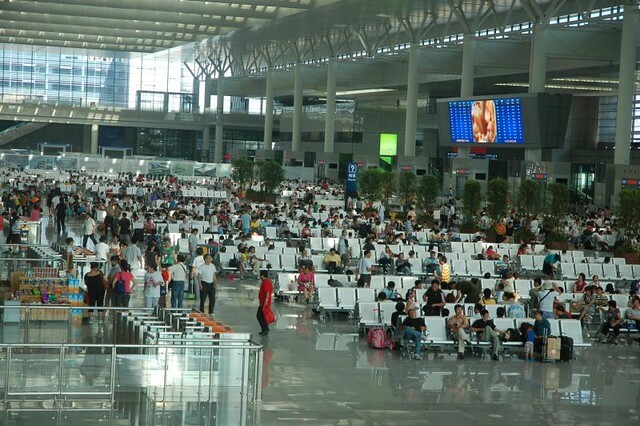 The Pudong Airport T2 also doubled the capacity of the first terminal, and both airports (in Beijing and Shanghai) can handle almost the same amount of traffic as current Heathrow airport (the current world busiest airport). Beijing didn’t stop because the second airport is also under discussion with the completion of the new terminal.If you look at the whole China, the scene is even more amazing. Beijing’s second airport is only one of the 97 new airports to be built in the next 12 years in China. That is almost 2/3 of the number of the current airports in this country. Raise of economic power? I think so. Besides the current Donghai Bridge (46 km in length and extends to Yangshan Deep Water Port) that was completed in 2005, the second large bridge, from Shanghai to Hangzhou, crossing the Hangzhou Bay – if there is a bay area, maybe this is the best place to name it. The bridge is going to open on May 1, 2008. It is now the largest bridge in the world – another world’s mega-project. Before this cross-sea bridge opens, the second cross-sea bridge already started construction, just 50 km west of the first bridge, while the third bridge is under planning. If the first cross-sea is far beyond my imagination, the next two bridges sound like fair tale to me. What does it mean? It may mean the hottest city circle in the world may emerge, with Hangzhou, Shanghai, Ningbo, Shaoxing, Jiaxing, and many other cities connected deeply with each other via express ways. Besides what is happening in the south of Shanghai, another mega project is going on on the north. The bridge and tunnel connecting Shanghai and Chongming Island and from the island to Jiangsu province is under construction and will open in 2010. The tunnel and bridge will connect China’s third largest island with the mainland, and also connect the north China to Shanghai crossing the wide Yangtze River. Just imagine what if all the projects are completed! The Beijing to Tianjin – two of the largest cities in China were just connected via high-speed train. The 120km high-speed train cost people only 30 minutes to commute between the two cities. At interval of 5 minutes, the train runs at 350 km/hour (just a little bit slower than the maglev, but still fast enough, especially considering the lower cost, it is a good choice). 30 minutes may mean that to live in Tianjin and commute to Shanghai is possible alternative for people in the two cities. Besides the Beijing and Tianjin high-speed train, the Shanghai and Beijing train (beside the old line) is also under construction, and the high-speed train between Shanghai and Nanjing (besides the old line) are also on the way. In the future, fast-speed trains will connect the most powerful cities in this big country, and more economic power will be generated with these lines. In Shanghai, the Hongqiao Train Station is going to be the largest train station (much larger than also huge Shanghai South Station). Maglev will also go to the station. With Maglev connecting the two big airports in Shanghai, people may transit in just 15 minutes – how people can believe the two stations are 40 km away from each other, and one is on the east most and the other is west of the largest city in China. In the last month of the last year, 58 metro (or subway, if you want to call it this way) stations were put into use on the same day! They are just part of the 150 subway stations currently under construction in this city. If you look at the future metro map, you will be amazed that places like Chongming Island, and Dishui Lake are connected by metro. All these locations are almost the farthest locations in Shanghai. In Beijing, its the same. In Nanjing, it is the same. In many cities in China, subways are spreading quickly, and more and more lines are running underground. If you look at the whole China, I was so amazed by the expressway network. In my Luoyang, in central China’s Henan province, I was happy to see the expressway connected Luoyang with the near by city – Kaifeng, and Zhengzhou, something around 200 km. I haven’t thought about how close these three cities are with the express way. Pretty exciting, isn’t it? However, if you look at another name of the segment of the expressway – Lianhuo Expressway, which means, it is part of a longer expressway, G30, that connects Lianyungang (at city at the East China Sea), and Huoerguosi (a city at the border of West Border) – it is 4280 km in length. The Mega project connecting the three cities is just 0.5% of the entire highway. Just like G30, G10, G12, G16, G18, G20, G22, G36, G40, G42, G50, G56, G60, G70, G72, G76, G78, G80 all run from the east-most city to central cities or west cities – all cross the country from east to west! From south to north, we also have G11, G15, G25, G35, G45, G55, G65, G75, and G85. The two Mega bridge (Shanghai to Ningbo, and Shanghai to Chongming is just part of the G15 Shenyang to Haikou expressway, again, less than 1% of the total length. China is building the world’s largest expressway network – just like Roosevelt built the current US freeway network. Although I am not an economist, I can see the huge economic power the highway network put into the country. nd sometimes the worst, and the brightest and the darkest, as I mentioned in my entry: blind men and the elephant. Today, in this moment, I do feel the best and the brightest from this country. There is no doubt that behind the mega-projects I mentioned above, there is a raising power – a power that people cannot afford to ignore.